As mentioned above, Bar Moga has a happy hour known as Coco's Spirit that's once a week on Wednesdays from 5 to 8 pm where spirits expert Coco Seo comes in to inform cranky people like yourself that just want to drink about Bar Moga's latest cocktail offerings. 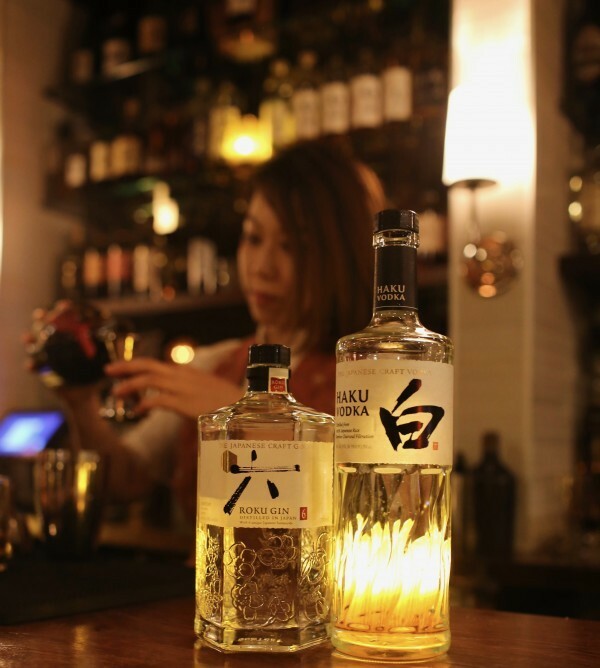 For the month of November, Bar Moga has two new offerings known as the one and only Haku Vodka (distilled in Kagoshima, Kyushu, made from 100% white rice and filtered through bamboo charcoal and comes in clutch with a round, subtly sweet taste) and its sister Roku Gin (made from six Japanese botanicals, sakura flower, sakura leaf, yuzu peel, sencha tea, Gyokuro tea, and sansho pepper and is also known to be perfect for citrus-based cocktails). Both drinks will be offered for $10 either neat or on the rocks (as for it's completely up to you) for your enjoyment. Additionally, Bar Moga will also be offering their 'Gin Fizz' and 'Cosmopolitan' cocktails for a special of $10 each (as compared to $13+). Given that the point of going to the bar is to drink, you're going to need something to eat. Take my word for it; Bar Moga has great veggie chips and kani cream croquettes... thank me later, but the last thing that you'd want to do is drink and not have anything in your system (unless the goal is to get drunk with a hangover in the morning; then you do you).